The Israeli-Palestinian conflict has a complex history. The different, often conflicting, narratives of this conflict contribute to its perpetuity. Although it is beyond the scope of this chapter to clarify the ‘historical truth’ in the Israeli-Palestinian conflict, it is, nevertheless, imperative to tease the common strands of the various narratives in order to reach conclusions that best reflect the facts. 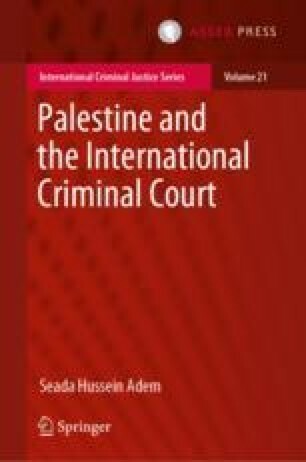 In light of this aim, this chapter provides a discussion of historical events ranging from the creation of the States of Palestine and Israel to military conflicts that gave rise to Palestine’s delegation of jurisdiction to the International Criminal Court. The stages leading up to the interaction of Palestine with the International Criminal Court are important not only to understand the general context of Palestine’s resort to the Court, but also the implications of possible investigation and prosecution through the Court. Due to their importance to the general context at hand, the chapter also covers military operations that led to the 2009 and 2014 Palestinian ad hoc declarations as well as some of the peace negotiations held between the two parties. Lapidot Y (n.d.) The Irgun: A short history. http://www.daat.ac.il/daat/vl/theirgun/theirgun01.pdf. Accessed 3 September 2015. Stuchtey B (2011) Colonialism and imperialism, 1450–1950. http://www.ieg-ego.eu/stuchteyb-2010-en. Accessed 23 April 2017.